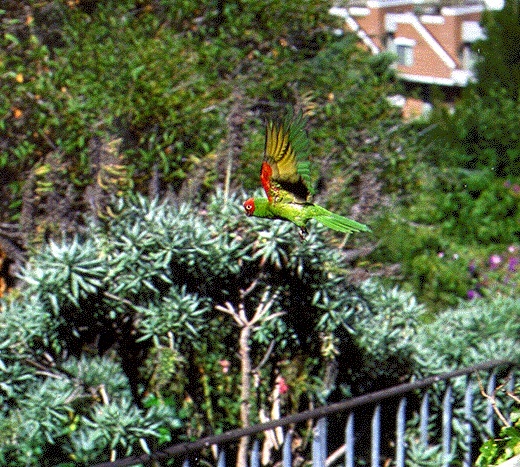 Parrots are among the more exotic non-native species in San Francisco. These are on Telegraph Hill in the mid-1990s. 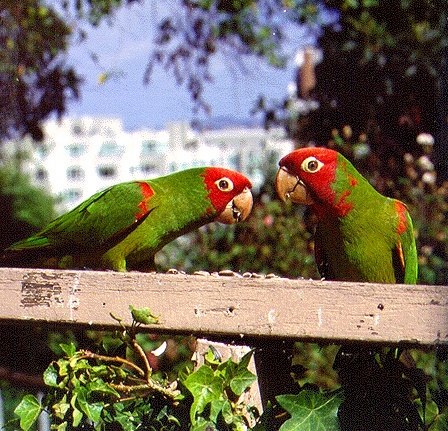 Free Parrots living on Telegraph Hill were first documented in 1911 and still have a home there today. A new species, as of the 1990s, has taken over: the Cherry-headed Conure. They are an invasive species that was originally native to Ecuador as well a small corridor of northern Peru. Mark Bittner documents his experiences of working closely with this new group of parrots that has taken over the trees of San Francisco. Telegraph Hill seems to have always been attractive to free parrots. There are stories of parrots on the hill in 1911 and again in 1930. In the 1970s a flock of Canary-winged Parakeets frequented the hill's trees and bird feeders. In the 1990s possession of the hill was taken over by a new flock of parrots made up primarily of a species known as the Cherry-headed Conure. I've been deeply involved with this flock since October 1993. The Cherry-headed Conure (Aratinga erythrogenys) averages 13 inches in length. It's mostly green with a red head, red epaulets on the shoulders of its wings and a cream colored eye ring. The bird is known to ornithologists as the Red-masked Parakeet. "Conure" tends to be used more by the pet trade. Conure is an older name for South American parakeets who were once all lumped together under the genus Conurus (meaning cone shaped tail). I usually call them conures because the word "parakeet" tends to cause confusion among people who are not familiar with parrots. Parakeet is a descriptive term for many different small to medium size parrots with long tails. The bird we typically call a "parakeet" in the U.S. is actually a kind of parrot. That bird's real name is the budgerigar or budgie. The Cherry-headed Conure is native to southwestern Ecuador and a small corner of northwestern Peru. It's not from the rain forest, but rather from an arid habitat known as Tropical Dry Forest. 99% of this habitat has been destroyed and the bird is listed as near threatened. Another factor contributing to its scarcity has been that in the 1970s and 80s the parrot was heavily "harvested" for the international pet trade. Since 1993, legal importation of wild birds into the U.S. has been severely restricted. Before this restriction was set in place, the cherry head was common in local pet stores. It was also inexpensive, selling for less than $100. The price made them attractive to many novice bird owners. But they were wild-caught birds, and once in their new homes they would take the first available opportunity to escape--something that even a breeder-raised, hand tame bird may do. Since they are extremely noisy, it's possible, of course, that some were set free deliberately. A number of these birds found each other in the north waterfront area and in 1989 began to breed. They have bred every year since. Most parrots -- according to what I read -- tend to mate for life. So far, in four years, most couples have remained stable. I have seen at least two divorces, however. Males and females cannot be distinguished visually. Like most parrots, the conures don't build nests, but use cavities in trees. They don't start them scratch, but will enlarge a preexisting hole. The preferred tree locally for nesting is the Canary Island date palm. The babies fledge in September and are entirely green and nearly full grown when they leave the nest. The flock flies as a single unit from around early October to early February. In February it gradually begins to break down into smaller groups as it heads into the breeding season. Females are on their nest by late June or early July and the flock at this time flies its territory in very small groups ranging from two to ten. As of this writing (12/14/97) there are 38 birds in the flock: 33 Cherry-headed Conures, one Blue-crowned Conure (Aratinga acuticaudata), one Mitred Conure (Aratinga mitrata) and three Cherry head-Mitred hybrids. Both the Blue-Crowned Conure and the Mitred Conure were wild-caught, legally imported birds. I know this because of a particular type of band, a quarantine band, that they wear on their legs. Of the 24 cherry heads in the flock at the time I first started observing, six wore quarantine bands. Only one of those birds is still alive. It's likely that all the other birds in the flock are native born San Franciscans. I feed the parrots as do a number of others. Much of their diet comes from the local vegetation, however. Among the trees and shrubs from which I have personally seen them eat are the loquat, juniper, apple, cotoneaster, flowering eucalyptus, pine, strawberry guava, and blackberry. They eat many different buds and blossoms as well. One of the most fabulous sights of the year is in February when they gather in the saucer magnolias to eat its large lavender blossoms. Many people have reported to me that they have seen them in cherry trees eating blossoms. Some people wonder how they get along with the local birds. I have observed them daily for over four years and have never seen them attack any of the native species. The only birds that I know them to fight with are other parrots. They will sometimes make a smaller native bird move from its perch, but that's the extent of it. Native birds, in fact, present to them the greater danger. There are local wild bird viruses to which they have little or no immunity. Most people don't realize it, but San Francisco also has a large raptor population. They are here year-round and the parrots are very alarmed by their presence. I've never seen a hawk actually take one of the parrots, however. There seems to be a certain amount of solidarity among birds. I have a number of sick or injured parrots from the flock living with me. Once I was standing out on my deck when I noticed one of them running out my front door which I had forgotten to shut. I ran to chase down the parrot. Because I rushed up on it so quickly, the parrot panicked and began screaming bloody murder in my hand. A scrub jay who witnessed the entire sequence from a nearby bush chastised me loudly and severely for this--and for quite a long time, too. Some people have accused the parrots of taking away a natural ecological niche from the local birds, but that seems an unreasonable accusation to me. The parrots -- along with most of the other birds that I see here -- are living in an artificial environment of planted gardens. The gardens consist of plant species that have come from all over the world. I think it unlikely, in any case, that the parrot population will ever be much greater than the small flocks that we have here now. While their numbers have been gradually increasing, the babies have a high mortality rate, and parrots are not prolific breeders. While I know little about genetics, it would seem likely that inbreeding will eventually be a problem for them. Far from being an annoyance, the parrots are an inspiration. It took this noisy and vivid flock of immigrants to get me to pay any attention at all to the native birds. I've met others who have told me the same. I see them as personable, humorous, and intelligent ambassadors of nature. They are no different from most other living beings in that they cherish their liberty and fear death. Besides, we brought them here against their will. I figure we owe them. Telegraph Hill from canoe on bay, 1996.